New Listing at our Seattle docks. More information soon! Taking the lead from the shorthanded offshore racing fleets like Whitbread and BOC around the world races, Saga has opted to maximize waterline length to gain the desired interior space, and to pare weight judiciously while retaining a relatively narrow beam. 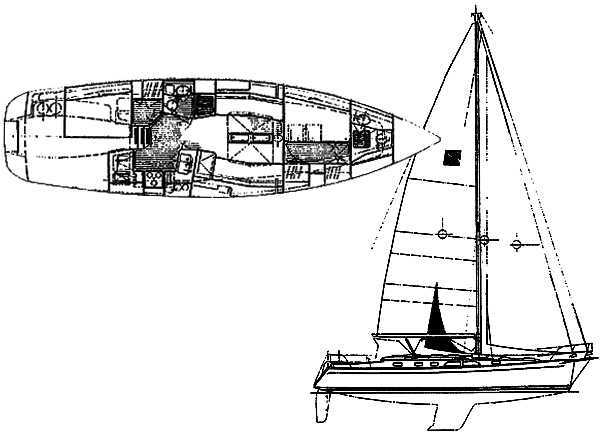 The hull has an ultra-fine entry angle with low drag, and is therefore very easily driven through the water and chop with far less sail area required. That makes for less strain on the rig, lower sheet and winch loads, and - most importantly - less sweat on the crew. Coupled with its 19,500 lb. displacement, the Saga 43 will require no more effort to sail than the average 38 footer. The Saga 43's longer waterline length translates to higher speeds under both power and sail. 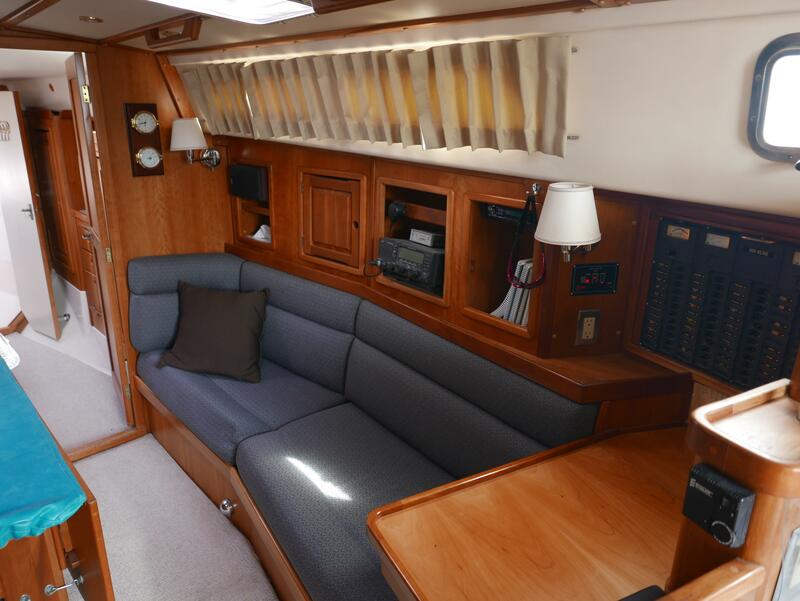 The Saga 43 performs more like a 50 footer with a dynamic waterline length of over 41 ft. when underway. 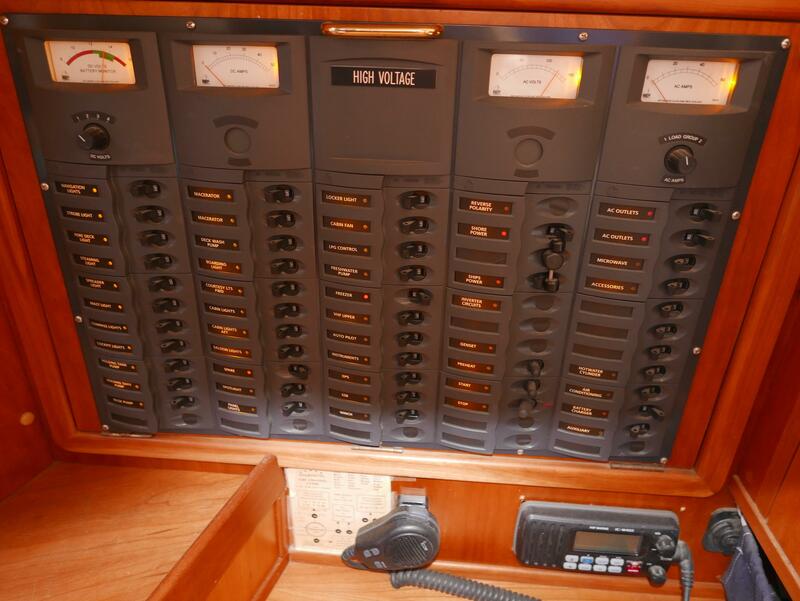 The Saga 43 rig is also heavily BOC influenced and optimized for shorthanded crews. Neither a cutter nor a sloop in the usual sense, the Saga 43 rig has tandem roller furling units for the headsails. The rig is proportioned so that it does not require overlapping headsails for power when sailing close-hauled. The inner furler handles the self-tacking jib for windward work. A custom Harken traveler on the forelock reduces tacking up a narrow channel to a mere turn of the wheel. After bearing away to a reach, the crew simply rolls out the special high reaching genoa on the outer furler to increase the horsepower downwind. The jib is then furled out of the way. The resulting forward shift in the center of pressure maintains a light balanced helm pressure and superior control. In light air and at deeper downwind angles, the asymmetrical spinnaker may be flown from the stainless steel bowsprit without the complications of either a conventional spinnaker pole or the associated leaks and problems of a retracting type pole. Mainsail hoisting and reefing chores are taken care of from inside the safety of the cockpit with a push of a button on the two speed, self-tailing electric winch. Mainsail handling is further simplified by a Harken TM "Batt-Car" system. The Saga 43 has several on-deck innovations. The stainless steel bowsprit supports the dual anchor rollers and gets the anchors clear of her near-plumb bow. 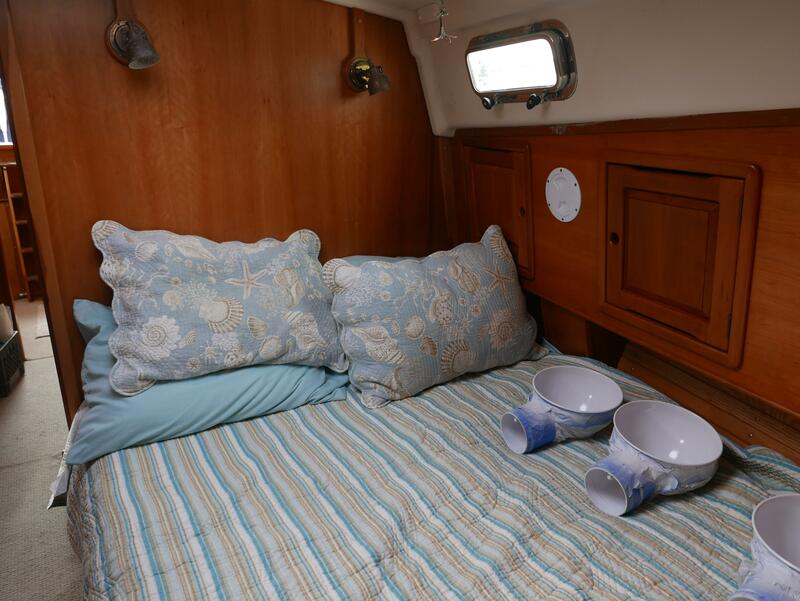 A combination of dorade vents, opening ports, and lots of hatches provide ventilation even in tropical heat waves. Storage wells at the mast base hide away halyard tails and winch handles. Further aft another set of coaming wells store the mainsheet, reefing lines, and halyards that are led aft, clearing the inevitable clutter in the cockpit. 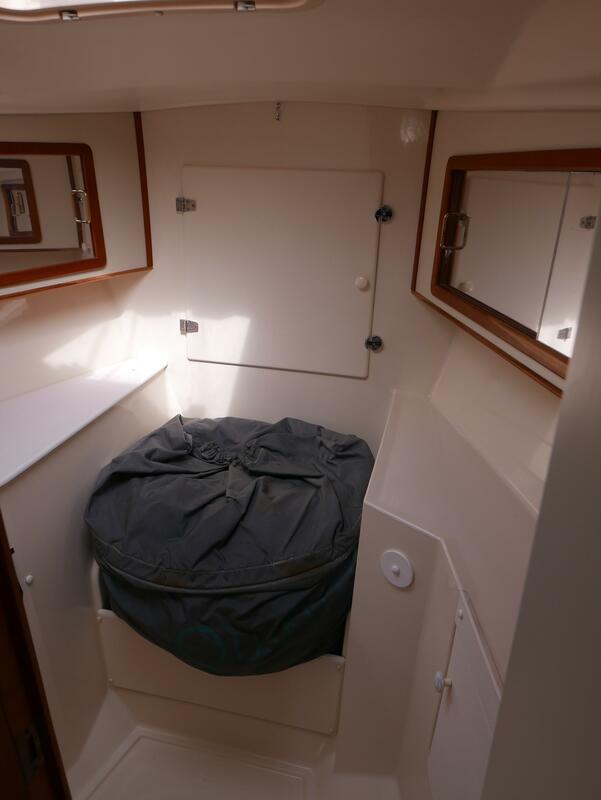 A self-draining storage locker for a six-man valise liferaft and even a proper CG approved vented locker to store the gasoline for the dinghy's motor are important features. The cockpit features 7'6" sculpted seats suitable for sleeping under the stars. The boat features the Saga walkout transom which is not only an offshore safety feature, but is also practical when boarding or swimming. Molded-in foot braces make the crew comfortable even when heeled. The "stealth" bridge deck has been designed so that while it will keeps water out of the cabin, it does not hinder entry below to the cabin. 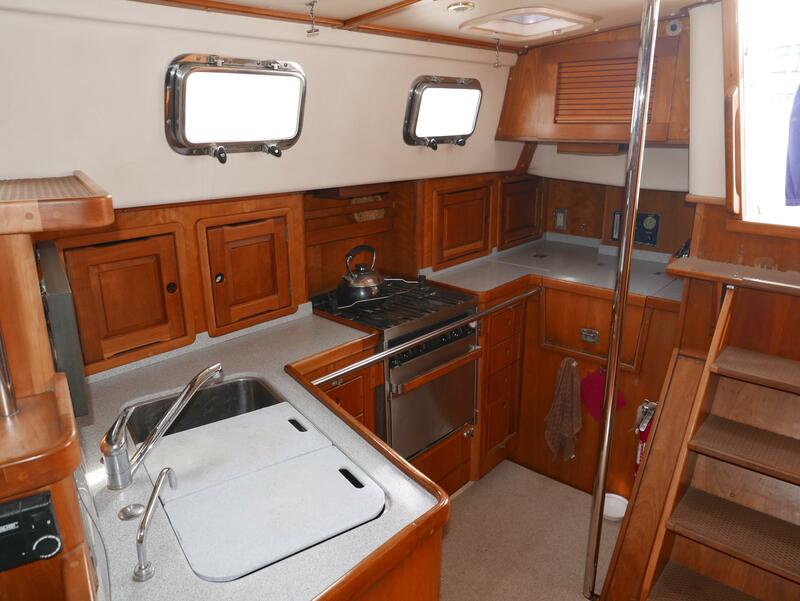 The main saloon is 14 feet across and the galley contains a large freezer - refrigerator with 12V refrigeration, a microwave, Force 10 stove, drawers and cabinets. 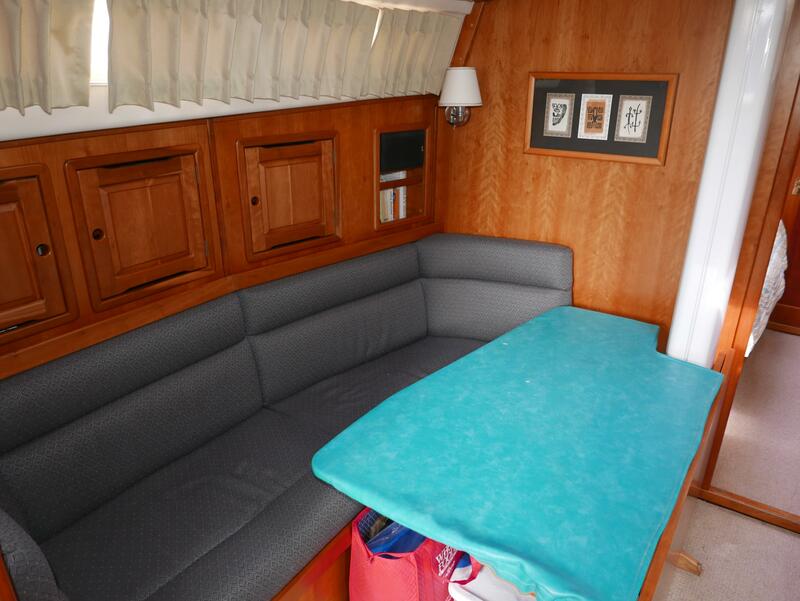 Forward of the galley is a working navigation area and inviting main saloon with a drop leaf table. All joinery is hand crafted, hand rubbed, and satin varnished in cherry wood. There is minimal exposed woodwork in the head - shower area for easy cleaning. The shower and head areas have molded-in non-skid floor surfaces for safety. Padeyes for crew safety harnesses are provided standard, as are two removable jacklines so the crew can work the length of the deck without unclipping. Lifelines and rails are 30" high, not the usual 24". Mast rails are provided for crew support while working at the mast. 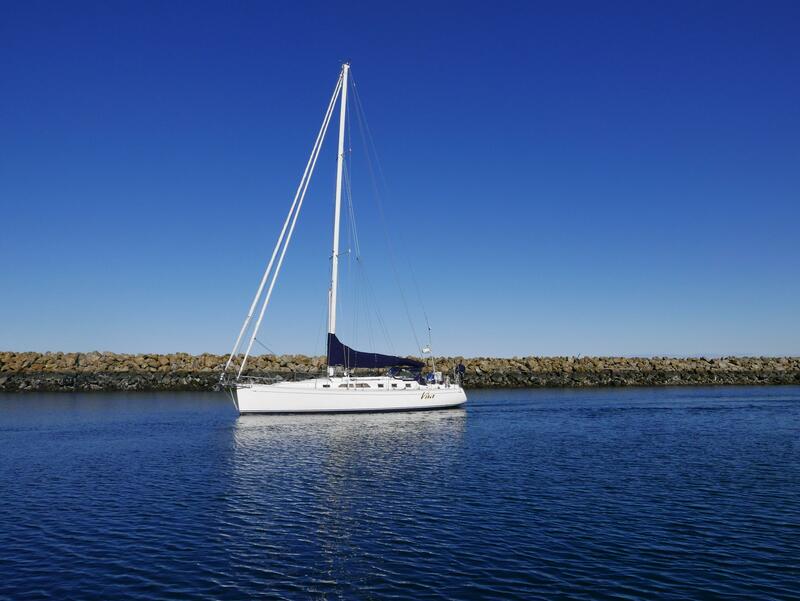 The mast comes equipped with a storm trysail track and a spare main halyard is standard. A captive retention pin is provided to positively lock hatchboards in place. An additional high volume manual bilge pump mounted below the main saloon sole is included, in addition to the pump mounted in the cockpit. 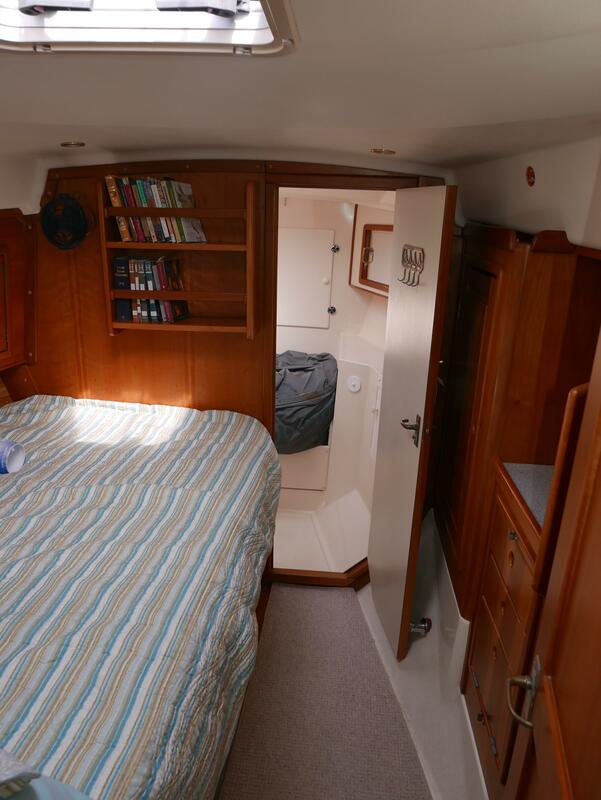 The main saloon berths are equipped with lee cloths for off-watch sleeping. 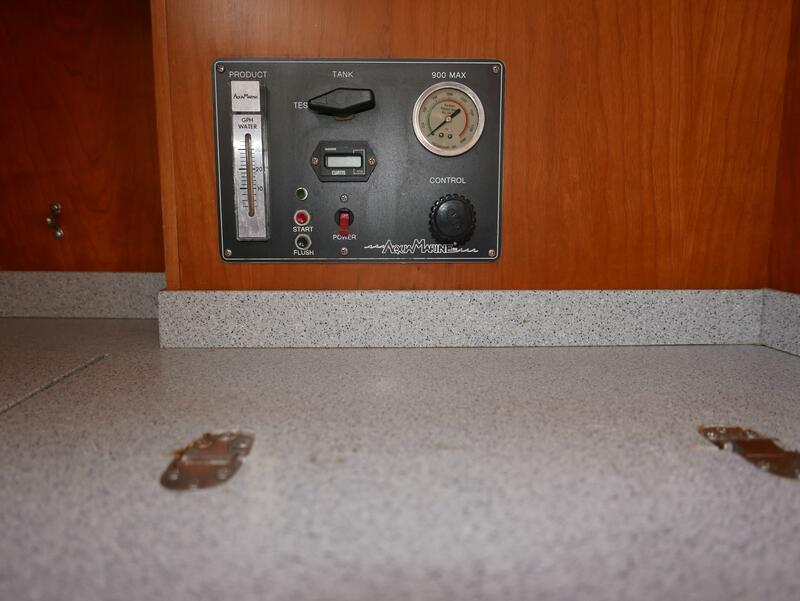 The galley stove has a stainless steel guard bar to prevent the cook from failing into a hot stove and the galley belt is provided for cooking underway. 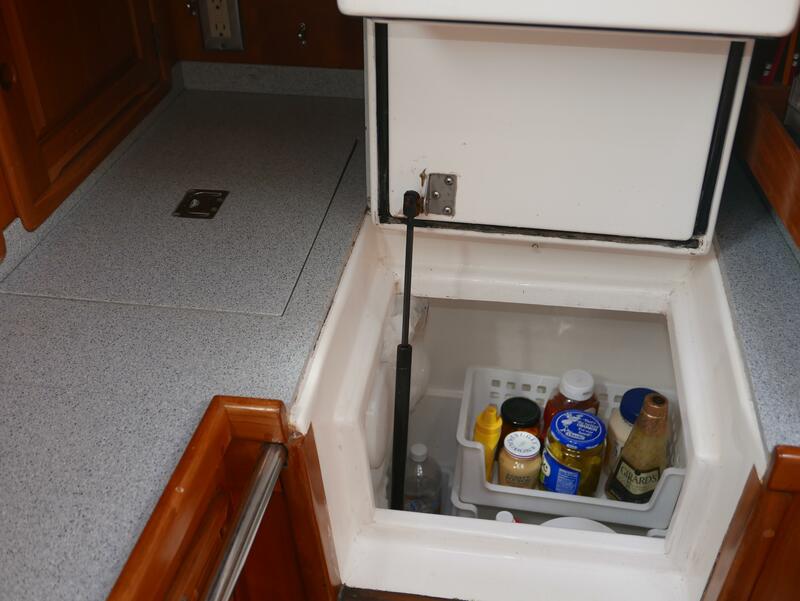 All cabinets and drawers are positive locking in a seaway. Saga 43 Specifications - Standard Equipment General Construction - 100% hand-laid fiberglass construction in temperature and humidity controlled work environment. - Lamination is resin content controlled and hand-squeegeed for high glass - resin ratios resulting in high strength - weight ratios. - One piece hull lamination with integral molded hull - deck flange. - Premium ISO NPG gelcoat for maximum durability and osmotic blister resistance. - Vinylester resin back up to gelcoat - 2 layers for added osmosis resistance. - Premium grade polyester laminating resins in remainder of lamination. - Bidirectional E-glass non-woven fabrics throughout, locally reinforced as appropriate. - Baltek balsa coring in hull and deck for the highest obtainable strength - weight ratio available without resorting to exotic materials. - Core material is voided in areas of through-hulls or deck hardware attachment. 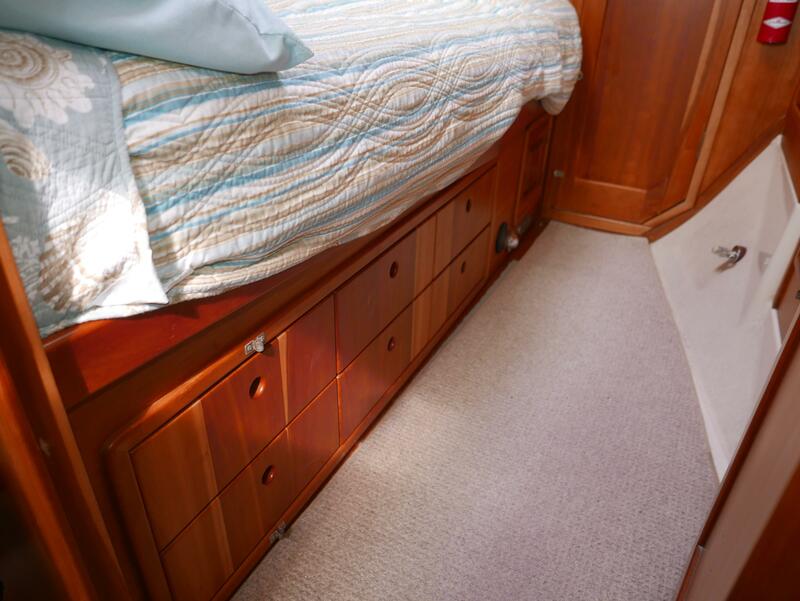 Heavy duty solid glass centerline line laminate additional keel and rig load support. - All hardware secured with aluminum or high-density composite backing plates. - Saga white hull with double waterline stripes. - Structural bulkheads and major furniture components bonded to hull and deck where appropriate for a rigid monocoque hull structure. 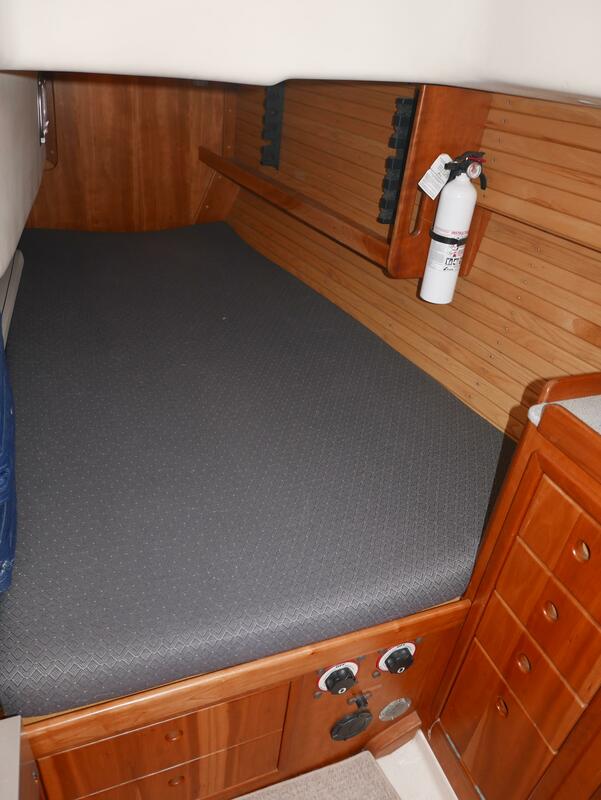 - Hull and deck joined with polyurethane adhesive - sealant and through-bolted every 4" with custom aluminum slotted toe rail incorporating an extruded PVC rub rail providing excellent hull side protection (PVC rub rail can be easily owner renewed). - Massive fiberglass subfloor framing structure, utilizing bidirectional E-glass reinforcements for hull stiffness and added strength spreading keel and mast loads over wide area. - Mast is keel stepped on subfloor structure. - External cast lead - antimony keel attached with double row of 10 x 1" keel bolts to heavily reinforced solid laminate keel sump. - Shoal draft bulb keel optional. 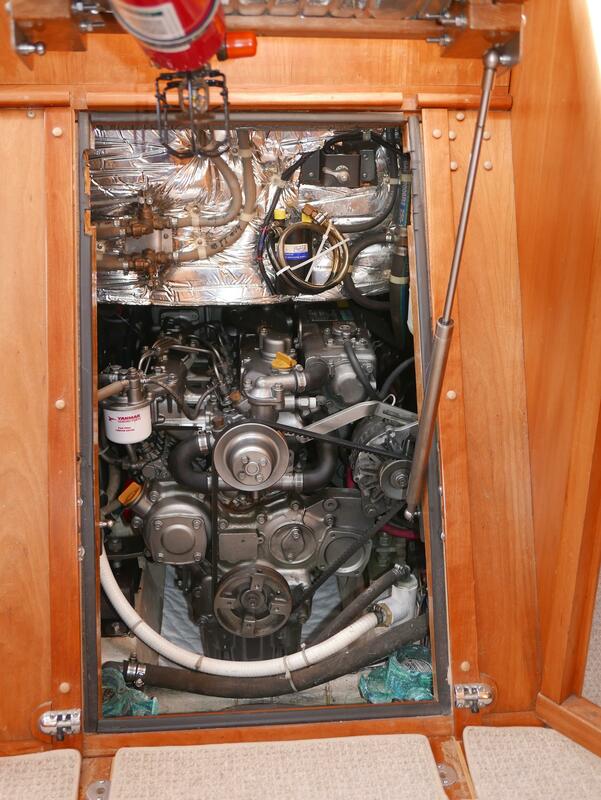 - Deep bilge and keel sump to contain bilge water and increase righting moment of ballast. - Electrical wiring and plumbing filled with HD grommets for chafe protection where appropriate. - Low friction rudder bearings. - Stainless steel rudder shaft, 4" diameter, welded substructure. - Balanced rudder design for extra light sensitive helm pressure, tight turning radius for easy docking and maneuvering under power or sail. Reverses under power in either direction. Deck Features - Saga white deck, easy cleaning, diamond pattern molded-in non-skid areas in appropriate areas contrasting light-beige color in non-skid areas. - Seating areas on coaming and cockpit seats are a leather grained non-skid pattern for added comfort and less wear and tear on skin and clothing, logical seating areas are Saga white for sitting comfort in tropical heat. - Deck carapace - storm hood organizes conceals and protects halyards, reef lines and other control lines led aft to cockpit and in increases crew safety by reducing possibility of tripping. - "Tropics-Friendly" low maintenance construction - no exterior teak or wood trim. 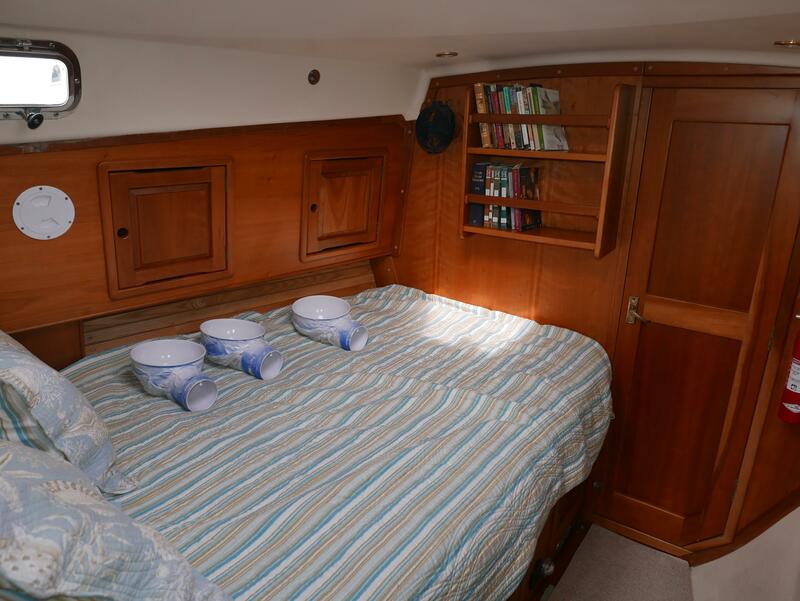 - Four fiberglass, dorade boxes with S-S cowls, integral with deck molding and incorporating two storage lockers port and starboard of mast for rope tails and winch handles. - Foot braces molded in cockpit floor for helmsman and crew. - Eight deluxe stainless steel trained opening ports, four large fixed portlights. - One aluminum opening port in cockpit footwell to aft stateroom. 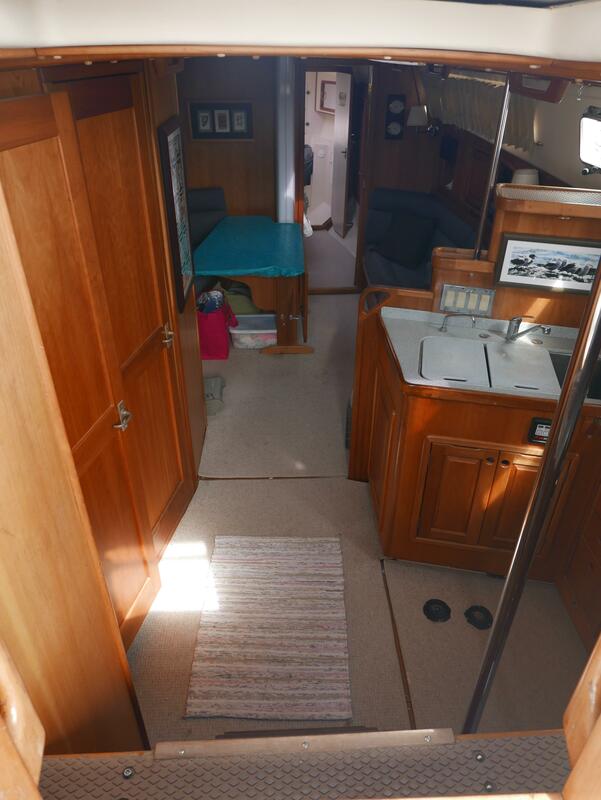 - Easy one-step ingress - egress over bridgedeck to main companionway and ladder. 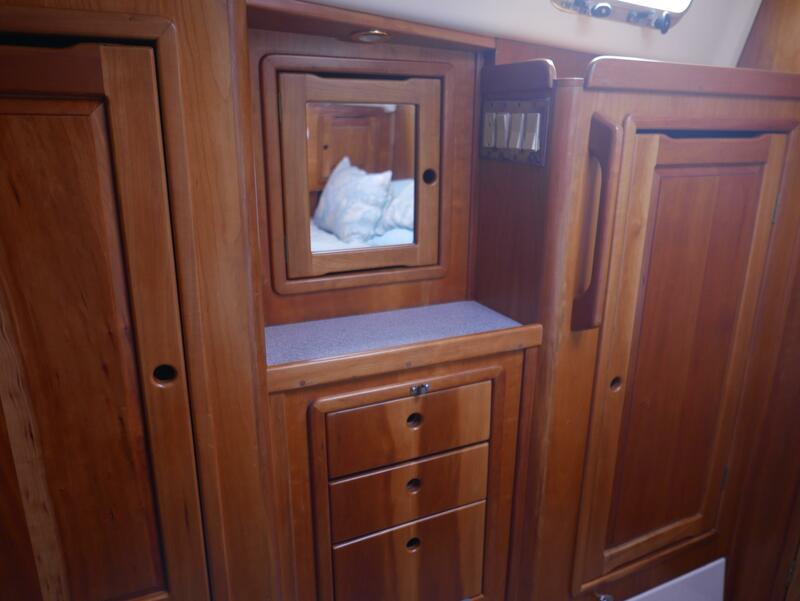 - Companionway sliding hatch with self-draining storm hood, Plexi hatchboards, bridgedeck, captive hatchboard safety pin for use in heavy weather. - Recessed engine control pane, provision for recessed autopilot control head. - Recessed provision for on-deck navigation instruments in cockpit bulkhead. - Extra-long 7'6" cockpit seats suitable for "al fresco" sleeping. - USCG approved propane tank storage locker vented overboard. Space for 2-20# gas bottles. - Special liferaft storage locker for 6-man valise liferaft in cockpit, self-draining. - Special safety locker for dinghy motor gasoline tank (for standard OMC 6 gal.) in starboard cockpit seat, sealed, vented, and self-draining for gasoline vapor drainage, similar to LP locker. - Walkout swim - boarding platform at cockpit floor level with hinged door - no need to climb up and over seats or transom. 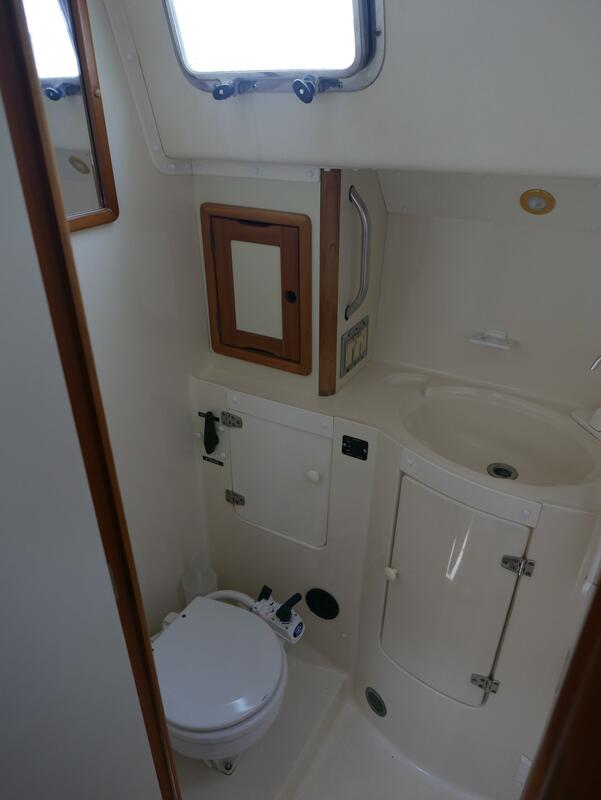 - Ultra fast cockpit drainage at any heel angle provided by a combination of transom door ports and conventional floor drains with hoses and through-hulls. Deck Hardware - Premium Harken winches, blocks, and deck hardware (where available). - Two Harken #53.2STC two-speed self-tailing primary cockpit winches. - One self-tailing Harken #40 2ST electric powered two-speed cabintop-mounted winch to main halyard and mainsail reefing operation. - Cabintop-mounted Harken #40.2ST two-speed, self-tailing, winch for mainsheet and jib sheet. - Two winch handles, one speed-grip, one standard - Storage boxes for halyard and reef line tails molded integral, with cockpit coamings, self-draining. - Self-tacking jib gear, including custom Harken traveler, blocks and sheet, led aft to port cockpit winch. - Cabintop-mounted mid boom Harken "Big Boat" mainsheet traveler system with 4:1 crosshaul lines (provides for easy dodger and Bimini installation and less cockpit clutter). - Fairlead blocks and tracks for reaching genoa. - Edson pedestal wheel steering system with friction brake, S-S wheel and pedestal guard. - Ritchie #DNW 200 compass, pedestal mounted. - Emergency tiller. - Pedestal mounted single-lever engine controls. - 30" high S-S bow pulpit, lifeline stanchions, stern rail with welded-on flagpole socket and flagstaff. - Double lifelines, double-wire lifeline gates w- pelican hooks, port and starboard. 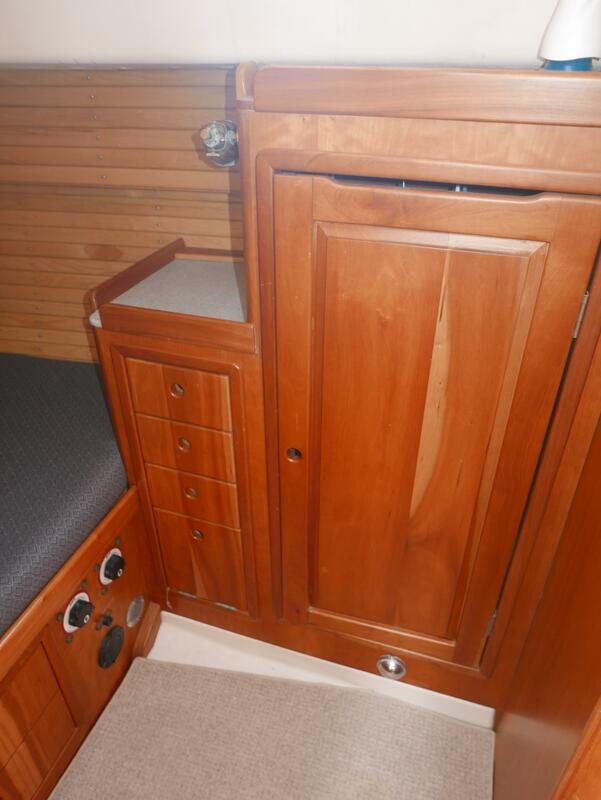 - Fiberglass transom door to swim scoop S-S swim ladder. - HD stainless steel bowsprit with dual anchor rollers. - Single deck pipe to divided chain locker below. - Stainless steel welded grab rails on cabintop - no varnishing or messy cleaning. - Four high-volume stainless steel cowl ventilators mounted on dorade style boxes with guards. - Stainless steel crew support rails port and starboard of mast, incorporating dorade guards. - 4 x 12" Mooring cleats, 2 x 12" amidships spring cleats, chocks. - Hot and cold fresh water shower recessed in cockpit. - 4 Safety harness HD padeyes in cockpit. - Removable tubular webbing jacklines for crew safety harnesses port and starboard on 4 HD padeyes. Allowing run of full-length of deck without unhooking tether. Plumbing - All water system plumbing of nylon reinforced soft-walled vinyl tubing, and conventional S-S screw type hose clamps to facilitate owner accomplished repairs in remote cruising grounds. - All through-hulls UL approved 1-4 turn ball valves, non-corrosive Marelon. - All through-hull hoses equipped with 2 hose clamps for redundancy. - All through-hulls labeled. - Hot and cold pressure water system with 12V multi-fixture pressure pump, accumulator tank, charcoal filter. - Showers in both heads with sump pumps. - Cockpit shower, H & C. - 11 gal. hot water heater with both engine heat exchanger and 120V AC operation, UL approved. - Manual fresh water pump at galley sink. - Approx. 140 gal. water capacity in two tanks, selector manifold for tanks. - Each marine head has approx. 20 gal. holding tank, Y-valve, seacock, electric macerator pump, for overboard discharge without dockside facilities, where legal. - HD manual emergency bilge pump mounted in cockpit near helm. 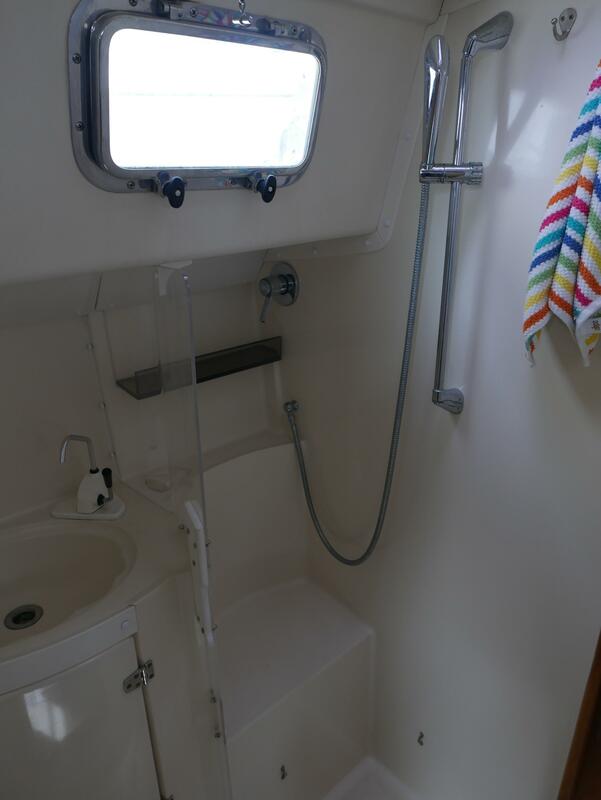 - Second HD manual emergency bilge pump mounted in main saloon below cabin sole for operation from below with all hatches and ports closed. Owners personal items and artwork are excluded.